What Is A Pellet Grill Smoker? If you are at all into grilling and/or smoking your food, you’ve likely heard talk about pellet grill smokers, also called wood pellet grills. Perhaps you aren’t exactly sure what the fuss is all about, or are curious about what is a pellet grill smoker; let’s dig in together and find out all about them. Why Is Wood Pellet Grilling Becoming So Popular? How Do Pellet Grill Smokers Work? What Kind Of Pellets Do I Need? What Are Disadvantages Of Wood Pellet Grill Smokers? Is Pellet Grilling Difficult To Learn? 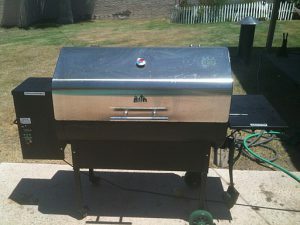 A pellet grill smoker is an automated grill that uses hardwood pellets as fuel instead of gas or charcoal. They are simple to use, convenient, and cook up some fabulous food. How are they automated? Pellet Grill Smokers have a thermostat in the cooking chamber that sends signals to the unit’s computer. The computer then regulates pellet delivery to the firebox via a motorized auger. A fan forces hot air (and/or smoke) through the cooking chamber much like a convection oven. In a nutshell, you get the great flavor of cooking over a hardwood fire, the push-button convenience of a gas grill, and an incredible “set and forget” computerized thermometer that you just don’t get in a traditional smoker. First off, your pellet grill smoker needs to actually be plugged in to work. Just a standard 110V outlet will do, but the grill does need electricity both to start it up and to run the whole time you are cooking. To get it started, you first fill the hopper with food-grade hardwood pellets (see more on pellets below), and then set your desired cooking temperature. Press the “on” switch, and a motor will turn the auger, feeding wood pellets into a firebox. Then a hot rod heats up enough (via electricity) to ignite the pellets, and a combustion fan keeps them burning. There are vents inside the firebox to circulate air flow and together with the fan, they begin circulating the hardwood smoke and the cooking heat. The computer and thermostat judge when more pellets need to be fed into the firebox to maintain the heat. The fan does run the whole cooking time. It provides the required oxygen for the fire and creates a convection current through the cooking area. You can determine how much smoke you get, per your preferences. The higher your cooking temperature, the less smoke generated. You’ll get the most smoke flavor at temperatures below 225 degrees. If you have a large hopper, you can set & forget… even overnight if you want! Pellet grill smokers are perfect if you’d rather not babysit your food during a party too, but would rather enjoy a soak in a hot tub or play a few awesome outdoor games with your friends. To read up on some wood pellet grilling safety tips, click here. What Kind Of Pellets Do Pellet Grill Smokers Use? Pellet Grill Smokers run on hardwood pellets only, and they must specifically be food grade (not stove grade) for safety reasons (chemicals). Wood pellets come in a large variety of “flavors” or mixes, so you’ll be able to have some fun determining your favorite! Popular flavors are oak, hickory, cherry, mesquite… or the mixes sold by grill companies. You can purchase “Pressed” or “Plug” pellets, and both are said to work equally well. Pressed pellets are made from saw dust, and plugs from solid pieces of wood. Plugs do tend to resist moisture better than pressed so if you live in a humid area, you may wish to try the plug kind. Pressed however, come in some nice flavor blends. These pellets burn at about 8,500 BTS per pound per hour, and because they are so small, they burn cleanly and leave only a fine ash behind that will need to be cleaned out of the grill on occasion (most commonly done with a small hand-held vacuum). 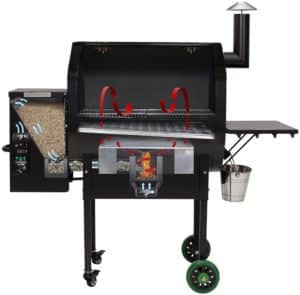 You can’t add wood chips directly to the hopper as they won’t fit through the auger, but if you really want to you can add them inside the grill itself – most grillers say they are completely unnecessary as you’re burning hardwood already and can get a fantastic smoke ring without them. As far as usage goes, you can roughly count on one 20lb bag of pellets being enough for several cooks, though of course it will depend on how long each cook is, your temperature setting, and weather conditions. Under normal conditions, pellet grill smokers can use a 1/2 pound of pellets per hour on a low smoke setting and 2-1/2 pounds at high temperature. The popularity of wood pellet grills is growing at an incredible rate simply because once someone sees or tries cooking on one, they realise that they have the ultimate grill & smoker in front of them. Wood Pellet Grills are extremely versatile units. They can maintain a large range of temperatures, and because of this, they can smoke, grill, bake, sear, roast, braise, barbeque, flame broil, and more! They can do what gas grills or charcoal grills do… and THEN some. Pellet Grills are very easy and safe to start up. Just plug in your unit, set your temperature, press the on button, and wait approx. 10 mins until the computer tells you the grill is ready. No messing with charcoal or lighter fluid, no guessing the temperature… no danger of propane leaks or of singeing your eyebrows off if you spark a propane unit while leaning in too closely. You can set the temperature with pin-point accuracy on most pellet grills, much like an oven – and can trust it’ll stay there (within 5 degrees), even for long cooks. With gas and charcoal grills, you are constantly watching the thermometer to see if you need to turn it up or down. In a good wood pellet grill, because it works like a convection oven, you can simply load it up inside with food, and trust everything will cook evenly, no matter which rack you put the food on, or where on the grate it is located. The actual design of the grill discourages flare ups altogether. 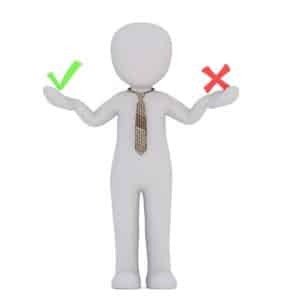 However, wood pellet grills are much more mechanically complicated units, meaning regular cleaning and maintenance can be expected, and, that more could possibly go wrong (look for a good warranty). While I love wood pellet grills, they do have some “Cons” that you should know about. Because wood pellet grills depend on electricity, they are not all that portable (unless you have access to a generator or inverter). If you like a good sear on your food before smoking it, most pellet grills can’t achieve that with fan-driven heat. Some units have flame broilers and/or sear boxes that try to make up for this. You will also need an airtight container to keep your pellets dry, or store them indoors (especially if you live in an area with a humid climate). Pellets will disintegrate if exposed to moisture. Pellet grills are fairly complicated units, mechanically speaking – much more so than gas or charcoal grills. They have a lot of moving parts and electrical components, such as an auger, a fan, a heating element, a computer, meat probes and internal thermometers, and possible Wi-Fi or Bluetooth components. All this complexity requires means you’ll need to maintain it well and clean it much more often than you would a gas or charcoal grill. Pellet grilling is a hot trend right now, and one of the reasons for this is that’s SO much easier to master than a traditional smoking job, where you are dealing with chimneys and smoke levels, baffles, and hot spots. Because the wood feeding and temperature maintenance is so automated, and because in theory it is a grill/smoker that works like a convection oven, people who purchase a pellet grill are finding they are THRILLED with how great EVERY meal is that they are cooking on them. Pellet grilling recipes, advice, and step-by-step instructions are all over YouTube as well, so if you are a complete novice, have no fear you’ll be lost in a grilling world all alone! I hope this was helpful in answering your question of what is a pellet grill smoker? Overall, your take-away here is that pellet grill smokers are fantastic. They are versatile, easy to use, make great food, and are definitely what you want on your patio this grilling season! If you have any questions, let me know and I’ll do my best to answer them. Otherwise, I encourage you to head over and check out the best pellet grills this year has to offer!